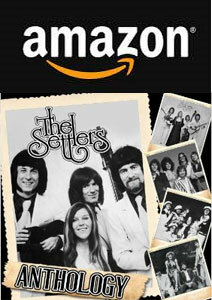 In 2010 I received a telephone call which blew me away – it was Valeryan the former lead singer with hit 60s and 70s folk-pop act THE SETTLERS with an innocent request to convert an old tape to digital format. The tape turned out to be an early recording (pre-Settlers) of Vals – her hit UK English language version of “Plaisir d’Amour” recorded after Val had won Opportunity Knocks in 1965. It’s important to ensure that the history of such groups as The Settlers is transcribed and re-mastered for future generations of music lovers and music historians. As a label Speakeasy is committed to ensuring that as many Artistes from the formative era of such genres as folk-rock, jazz-rock and classic rock are available. For their time The Settlers were highly innovative, polished and professional entertainers as well as being excellent musicians and especially close harmony singers – in the same mould as The Kingston Trio, and especially The Seekers. They pre-dated Fairport Convention, Pentangle and other folk-rock acts by several years. . The Settlers’ first single “Sassafras”/”Settle Down”, was released in 1964. They became well known nationally, assisted by frequent appearances on television and, until 1967, regular exposure on offshore pirate radio stations. In particular, their recording of John Lennon and Paul McCartney’s “Nowhere Man” (1965) was, together with The Overlanders’ 1966 UK No.1 hit, “Michelle”, and The Truth’s version of “Girl”, among the best known covers of songs from the Beatles’ album, Rubber Soul (1965). However, although “Nowhere Man” reached a high of No.5 in Radio London’s non-sales based Fab 40 in March 1966 and the group’s spirited version of Gordon Lightfoot’s “Early Morning Rain” received a good deal of airplay in May 1966 , the Settlers did not succeed in enjoying a Top 40 hit during the 1960s. Their most successful record, “The Lightning Tree” (helped along due to its use as the theme tune of the British TV series Follyfoot), reached the UK singles chart in 1971[ Like the Seekers, the group also included a double bassist. The original bassist, Mansel Davies, left in 1965 to pursue a career in teaching, and was replaced by Geoffrey Srodzinski, who shared accommodation in Hampstead, London, with Tony Hooper of Strawbs. Hooper’s song, “Always on My Mind”, was released as a single by the Settlers early in 1967. Whereas Go!, (Pye Records, 1966) paired the group with The Overlanders both separately and together. The eponymous The Settlers, for (Island Records, 1967) included Bob Dylan’s “Blowin’ in the Wind” and “Mr Tambourine Man” and such folk standards as “The Wreck of the Old 97”. Call Again for (Marble Arch Records, 1968) collected the group’s singles output for Pye Records, and was released after they had left that record label. Settlers Alive for (Columbia Records, 1969) was recorded live at Queen Elizabeth Hall, whilst Sing a New Song (Myrrh, 1972), had a strongly religious component. Lightning Tree (York, 1972), which, in addition to the title hit, included extracts, spoken by Cindy Kent, from Martin Luther King’s famous I Have a Dream speech of 1963. Lightning Tree was re-released by Decca in 1974 as The World of the Settlers. In 1974 Mike Jones produced The New Sound of The Settlers. Featuring the band’s second vocalist Andie Sheridan replacing original vocalist Cindy Kent who had been with Jones since they had originally formed in the mid 60s as The Birmingham Folk Four. This marked a distinct and in some ways terminal departure from their original folk roots, Jones described this as a “progression” from their “folk tag” to a much wider musical approach, with more contemporary backings, whilst maintaining a harmonically thick vocal line. Andie only stayed with the group a short while. In 1976 Valeryan joined and I produced and co-wrote their next A side for Riverdale, a label owned by The Foundations former manager Barry Class – this was Billy Which away By now Valeryan was lead singer – the last to feature in The Settlers before they disbanded in 1979. Mike Jones died in 2008 and the initial singer, Cindy Kent, is an Anglo-Catholic priest. Valeryan and I selected a number of tracks which showcase the different stages of the development of The Settlers. The seeds of their failure to become as internationally known as The Seekers or other top-line American bands was I believe due to Jones’ pursuit of a UK “club / cabaret” audience requiring a middle-of-the road approach to song selection and arrangements. He was successful in that ambition, but could easily with vocalists such as Cindy and Valeryan have reached higher, focussed his music more tightly and succeeded internationally. Compare and contrast with the huge success of The Spinners, with their own long-lasting TV series, and later Birmingham acts such as Fairport Convention. I certainly found this when I produced the band; Jones was happily making a living rather than aiming higher.